With Homax EasyGate No-Sag Gate Kit you can easily fix or build a sag-free gate, while adding style to your outside décor. There are no height restrictions with EasyGate, and it can be used for openings from 25 to 72 inches. Installation is easy because no Z-bracing or angled cuts are required. Measure the opening where you want to install EasyGate and cut the top and bottom rails 1 inch smaller than the opening. 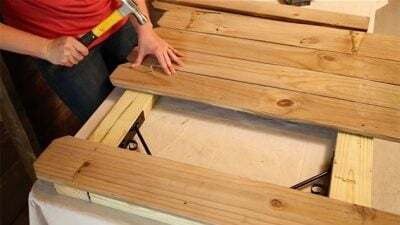 Place the top and bottom gate rails on your work surface. Line the brackets up with the end of the boards. Mark the screw holes on each bracket and drill 1/8-inch pilot holes. Attach the brackets using four included wood screws. Then use eight included pan head screws to finish attaching each bracket. You’ll notice some of the brackets have two holes in a single location, use only one screw in either hole. Using four included wood screws, attach the top hinge. Use four more wood screws to attach the bottom hinge. Decide which side the hinges will be on, and which way the gate will swing. Nail your fence boards across the gate frame. Now you’re ready to attach the gate to your fence. Secure the top hinge to your fence post with four wood screws and repeat on the bottom hinge. Check the gate’s swinging motion. Watch the video for detailed instructions. Where can you buy this kit ??? Looks like a good idea.